Ezekiel Bread; a meal in itself. I've posted this recipe a few times prior, but not in quite a while. 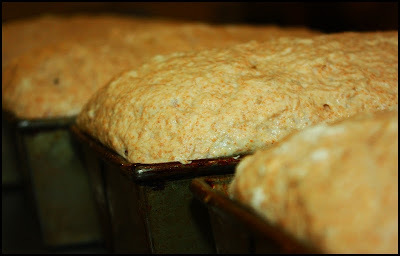 It is my favorite bread (to eat and to make) and in fact is still the #1 reason people visit this blog. More than 500 people find their way to my little page each day for this simple but delicious recipe. As I've also mentioned before, while this recipe looks somewhat difficult to make, it is really not (read the directions in steps). One of the biggest difficulties people seem to have is that the dough is too wet (likely from not squeezing out the beans and grain enough). This is not a problem, simply add additional flour. This bread is not only delicious, but also nutritious. If you are a baker, or someone who wants to bake, I hope you try this recipe...you won't be sorry. There are additional links below. Boil the grains in the water in logical succession according to cooking times: first the white and red beans (about 60 minutes), when they are soft add the, spelt berries, lentils, and barley (about 30 minutes); lastly, add the millet and bulgar (about 10 minutes). The key is that after each addition the previous grain must be soft enough so that when all of the grains are in the pot they will all be equally soft; undercooked grains (especially the beans) can really ruin this bread. And as the grains cook add more water to the pot as necessary because the cooking liquid, which is full of nutrients, will become part of the recipe (keeping a lid on the pot will slow it's evaporation). After the grains are cooked allow them to cool in the liquid to room temperature, refrigerating if necessary. 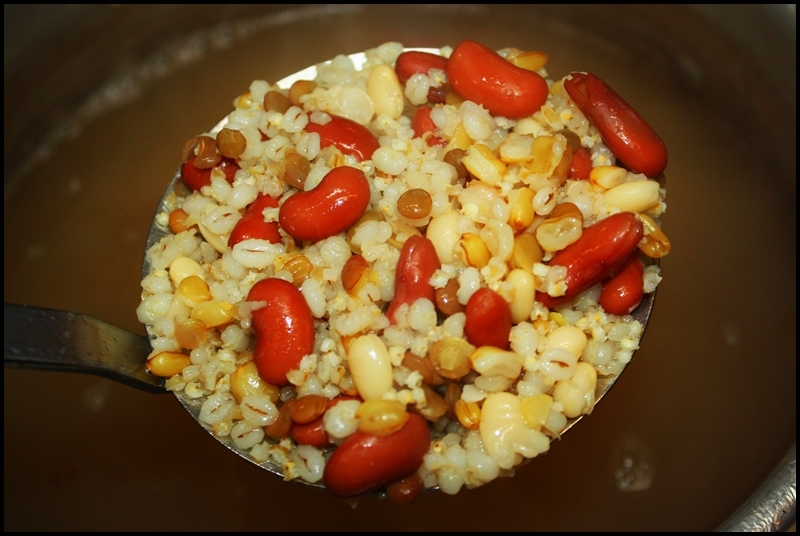 After the grains are cooled drain them, squeezing them with your hands or the back of a spoon, reserving the cooking liquid. Place two bowls side-by-side; one will hold the pre-ferment, the other autolyse. In one bowl combine the cooked and drained grains with ½ cup of the cooking liquid, 2 cups whole wheat flour, and 2 teaspoons instant yeast. Stir it just until combined then cover it with plastic wrap. In the other bowl combine 4 cups whole wheat flour, 3 tablespoons vital wheat gluten, and 2 cups cooking liquid; stir it just until combined then cover it with plastic wrap (take care not to get yeast into this bowl). Allow the bowls to rest at room temperature for about an hour, during which time the preferment will begin it's job multiplying yeast and fermenting flour, and the autolyse will soak liquid, swelling the gluten. After an hour or so, combine the ingredients from both bowls into the bowl of an upright mixer fitted with a dough hook. Add the honey, olive oil, salt, and 3 teaspoons of yeast (add the yeast and salt on opposite sides of the bowl. Knead the dough on medium speed for about 8 minutes. Place the dough in a lightly oiled container, cover it loosely, and allow to ferment for 1-2 hours, or until doubled in bulk. Deflate the dough and allow it to ferment an additional 30 minutes. Turn the dough out onto a floured work surface and cut it into 2 or 3 pieces. Shape into loaves and place into lightly oiled pans. Loosely cover the loaves with plastic wrap and allow to ferment for 30-60 minutes, or until double in size and when gently touched with a fingertip an indentation remains. Bake the breads for about 30-40 minutes, adding steam to the oven a few times (either with ice cubes or a spray bottle) and rotating the breads every ten minutes. 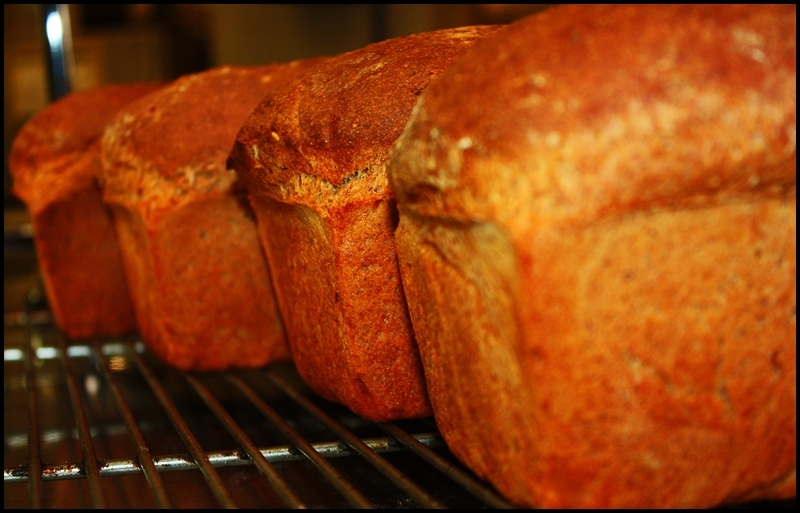 The breads are done when they are dark brown and sound hollow when tapped upon. Remove the breads from their pans and allow them to cook on a wire rack for at least 10 minutes before slicing. For additional directions and photos on how to make this bread, click here. The read my views and philosophy on this bread, click here. We have our tried-and-true %100 whole wheat plus mix-ins (millet, sesame seeds, walnuts, sunflower seeds, etc.) bread recipe, but this looks interesting. For the beans, do you soak the dry beans first? Do the beans just kind-of mash into the finished product, or do they hold their shape? Melissa, Ezekiel Bread generally contains beans, lentils, grains, etc. Many people sprout theirs, or sometimes the grind them into a flour. 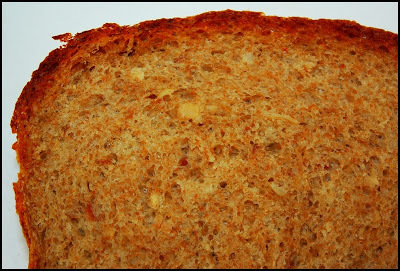 This is my version and it is my favorite (and likely my most healthy) bread. I do not soak the beans, I just simmer them for a long time. Then I use the cooking liquid as the liquid in the flour to capture all of the bean/grain nutrients. For the most part everything just sort of mashes into the dough as you knead it, but you will see a few specks here and there (especially if you use red or black beans). Thanks for visiting.